Anderson through to the O2 and Smith semi-final showdown! ]Team Unicorn stars Gary Anderson and Michael Smith will clash head on in the Premier League semi-finals in London. Anderson sealed a dramatic victory over Michael van Gerwen on home soil in Aberdeen to claim third place in the table. Smith was confirmed in second spot after his draw with Raymond van Barneveld. So a huge Unicorn showdown it is! Van Gerwen will now face Rob Cross in the other semi-final. Anderson’s place at Finals Night was actually confirmed before he played. As soon as Peter Wright hit D19 to win a third leg against Daryl Gurney, the Unicorn star had qualified. But he knew a victory over Van Gerwen would mean the pair avoided each other in the semi-finals, and Anderson was up for it. He broke throw in the opening leg but missed five darts for a 2-0 advantage and Van Gerwen turned it around to lead 2-1. But the Scot then reeled off three legs on the spin, including a 121 check-out after the Dutchman missed ‘tops’ for a second time to take out 160. Finishes of 104 and 81 on the bull saw Van Gerwen level, but the Unicorn ace broke again and then took out 112 for a crucial hold. The World No.1 forced the last leg but Anderson kept his cool and ‘tops’ saw him clinch a crucial win. 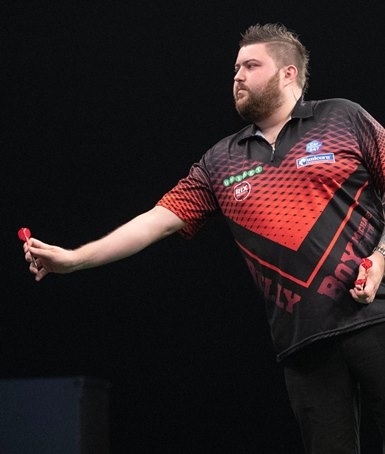 So Smith secured second spot in the table after a thriller against Raymond van Barneveld, and it was a brave, battling display from the Unicorn man who was told this week he is suffering from pleurisy. It really has been a phenomenal performance from Smith - arguably the highlight of his career so far. Can he now go on and claim the big prize at the O2? There was some sensational finishing. It was four apiece after eight holds of throw....Barney took out 122, 126 and 121 while Smith hit a vital 124. Van Barneveld then broke throw for 5-4 but Smith responded straight away after the Dutchman missed three darts to take control. Smith then nailed a superb 107 check-out to guarantee a point and Barney responded with a 91 finish to make it all square. So Smith against Anderson.....bring it on!